Did you know that some foods pack a more powerful nutritional punch if you eat them with other foods? Apricots and Almonds are one of these super-food nutritional combinations because they work in concert to give you balanced calories and help you process the vitamins each one provides. A baggie of almonds and dried apricots is one of my stables. 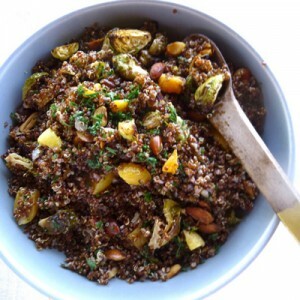 And then of course there is the magical Quinoa that everyone raves about for it’s high protein content! Here is my favorite quinoa salad. I especially love it now when the weather is warmer and I crave hearty salads. Cook quinoa like rice and cool. Whisk together ingredients and add to quinoa. Season to taste. Enjoy! It’s even better with a little time to marry all the goodies.